It’s been a while since I was on Instagram, even longer since I took a peek at Facebook, and you know what? I’m still here, and all is well. In fact, my voluntary social media detox has made space for the very thing I’ve been longing for: more time for creativity. But it’s not easy to remove oneself from a community, especially one that is filled with excellent and inspiring people. My fellow fiber artists on IG are wonderfully supportive folks from all over the world, many whom I’ve never even met, and yet we have all spun an interactive web of sharing and networking that can keep us all updated on who is weaving what and where the next great art show is. I can see how for some, social media keeps them humming along, nose to the grindstone, posting a photo of their latest masterpiece to share with their community. The scrolling newsfeed of inspiration can keep the imagination flowing, and everyone benefits from the participation and consistent updates of the other artists. For me, however, it ended up turning into a distraction, an excuse to not finish – let alone start – anything, and I only felt worse when I saw all of the beautiful work that others were creating and sharing and I didn’t have anything to contribute. On top of that, I was going through a dark night of the soul, and my muse seemed to have disappeared beyond my reach. 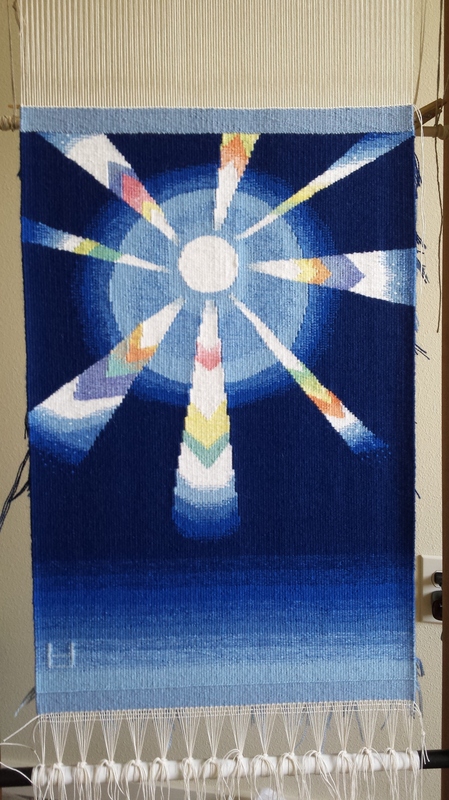 I counted the months since I had finished my most recent artwork on the big loom; 10 months. I’m used to doing about three larger pieces a year. I began to create more excuses; my day job was taking up too much time, I had to make dinner, I needed to knit a new hat, and there was my long Instagram feed to scroll through. I continued to play piano and thoroughly enjoyed that creative outlet, but I was secretly worried that it was the end of tapestry weaving for me. My imagination was blank. I decided that since I wasn’t making anything, and I was checking IG way too much, I would do a detox from the app and Facebook and just see what happened. Around the same time, I began to pack up most of my things and temporarily live with just the necessities in the upstairs guest room in my parents house until I found a new place. The abrupt change in my physical space, along with the freedom from comparing myself to others on social media, resulted in the perfect recipe for returning to my own authentic creative voice. I can see now that I was attempting to create within a very rigid mindset. What would get me more followers and likes online? Instead I should be wondering, what is it my soul wants me to create? What images inside of me do I need to bring to life? What wants to come forward and play into my work? I got so caught up in posting content that I forgot about the process. While I was working on my thesis in undergrad, smartphones had just come out and cost, like, a million dollars and I wanted nothing to do with Facebook. I instead stayed close and honest to the images and artworks I was creating for my thesis. I had no filter for what I thought the art world wanted to see and instead followed the inspiration and beauty that resonated most within me. My passion and dedication to this vision resulted in a moving body of work that was a hallmark of my college career. At times, I even surprised myself with what I was creating, and I know that it was because I stopped caring what other people would think. I instead opened up to the vast expanse of my own imagination, and followed it through the whole whirlwind process of completing a large body of work. This isn’t to say I don’t think that social media is a useful and necessary tool. As I said earlier, it can bring like-minded folks together to share stories and ideas, and therefore add more beauty and culture to our world. I do think, however, that there are times when a break is imperative and healing for the soul. It allows us to get back in touch with who we really are beyond the walls and boundaries we’ve set up for ourselves, and even to dissolve the stories of who we think we are. Am I leaving social media for good? Probably not, but until I return I will be putting my energy into getting back in touch with that authentic creative force within me, and creating the artwork I long to make. Stay tuned, and keep creating! This entry was posted in Inspirations, Works in Progress and tagged art, authenticity, change, courage, creativity, fiber art, inspiration, intuition, journey, motivation, perspective, process, reflection, storytelling, success on June 12, 2017 by lauralunastudio. Time really flies, especially when I get into the rhythm of weaving. I fall into just the right state of calm focus and inspiration, and the colors and shapes flow from my fingers. It can be hard to stop and take a step back, view the work, and take note of the progress, but this is one of the most important aspects of art making. I first learned this from my painting instructor in college. He would always remind us during class, while we were deep in the process of painting still lifes, to step back from the easel and view our work. Up close, you could only see the tiny details, but from ten feet back, you could see the whole picture. The sculptor, the painter, and yes, the tapestry weaver, need to get some distance between themselves and their work to see how it’s coming along. How do the shadows, light, contrast, and colors look? Is the composition still working? Are any shapes or forms slightly off? When your face is a mere 14 inches away from the canvas, it can be hard to take in the bigger picture. Viewing our work from a distance is also how our audience will see it, and it gives us a chance to admire our hard work. 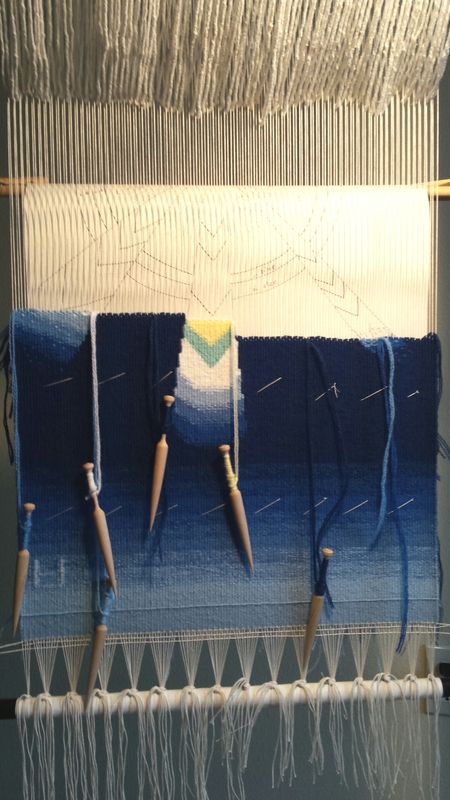 This design is an element from a larger tapestry that I will eventually make… when I have a bigger loom. The main design it’s taken from was partly inspired by my summer hike up to the alpine meadows of Mt. Jefferson near Bend, Oregon, and partly inspired by many late night moon viewings from my fifth floor apartment. 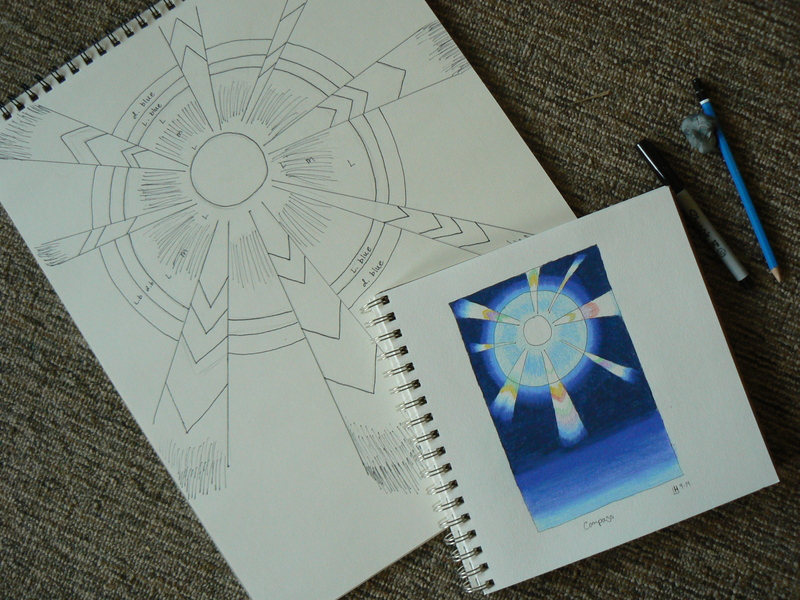 The moon/star symbol makes an interesting composition without the mountain and trees in the original design. So far, I’ve had to take two sections out, about four hours of work, because the areas weren’t following the cartoon (the white paper behind the weaving). Eventually this “small” error would have thrown off most of the overall effect of the design. Sometimes I don’t have to follow the cartoon exactly, and I enjoy the spontaneity that comes with improving, but I don’t have that freedom with this design. Again, another great example of the importance of taking a few steps back to get some perspective! I can’t emphasize it enough. *If you’re an artist, take a break every now and then while you are making (not just at the beginning or end of your studio time) and get some distance between you and your art. Soak in your progress and what you have learned, take note of what looks great and what might need to be improved. Then pick up the paintbrush, or bobbin, or carving tool, and keep making. *Even if you’re not an artist, this technique still applies to you; the artwork that you are looking at is your life! This entry was posted in Inspirations, Works in Progress and tagged art, art making, art technique, fiber art, inspiration, painting, perspective, process, reflection, tapestry design, Tapestry weaving on December 3, 2014 by lauralunastudio.